PARIS: “NOTRE DAME DE PARIS is on fire!” (15th April 2019) +++ OMG! Heart-breaking…. I am so sorry…What a disaster! What a loss! PARIS – The soaring spire of Notre Dame Cathedral in Paris has collapsed in flames, and a church spokesman says the entire wooden interior of the 12th century landmark is burning and likely to be destroyed. A massive fire engulfed the roof of the cathedral in the heart of the French capital. The mammoth fire later spread to one of the church’s landmark rectangular towers. A cathedral spokesman has said the entire wooden interior of Notre Dame is burning and likely to be destroyed. It is said that the fire started in the centre of the cathedral and that the 400 – 500 fire fighters are challenged to get access to the origin of the fire and to get water into the rest of the church. It is expected that the fire will continue burning for hours. French President Emmanuel Macron says the fire is taking part of all of France’s people with it and is treating it as a national emergency. Deputy Mayor Emmanuel Gregoire said first responders now trying to salvage the art and other priceless pieces stored in the church. Notre-Dame de Paris (meaning “Our Lady of Paris“), also known as Notre-Dame Cathedral or simply Notre-Dame, is a medieval Catholic cathedral on the Île de la Cité in the fourth arrondissement of Paris, France. The cathedral is considered to be one of the finest examples of French Gothic architecture. The innovative use of the rib vaultand flying buttress, the enormous and colorful rose windows, and the naturalism and abundance of its sculptural decoration all set it apart from earlier Romanesque architecture. The cathedral was begun in 1160 and largely completed by 1260, though it was modified frequently in the following centuries. 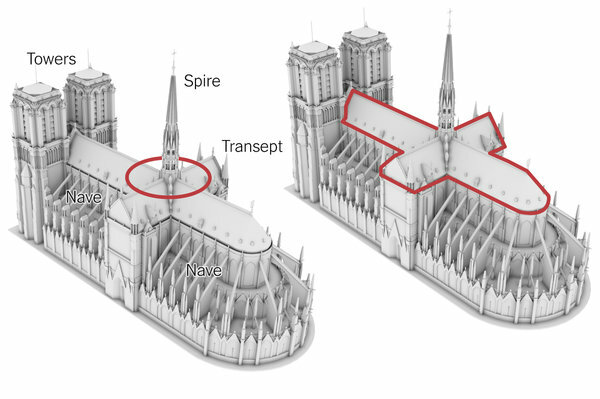 In the 1790s, Notre-Dame suffered desecration during the French Revolutionwhen much of its religious imagery was damaged or destroyed. Soon after the publication of Victor Hugo’s novel The Hunchback of Notre Dame in 1831, popular interest in the building revived. A major restoration project supervised by Eugène Viollet-le-Duc began in 1845 and continued for twenty-five years. Beginning in 1963, the facade of the cathedral was cleaned of centuries of soot and grime, returning it to its original color. Another campaign of cleaning and restoration was carried out from 1991–2000. As the cathedral of the Archdiocese of Paris, Notre-Dame contains the cathedral of the Archbishop of Paris (Michel Aupetit). 12 million people visit Notre-Dame yearly, it thus being the most visited monument in Paris. As of 15 April 2019, the cathedral is on fire, causing significant damage, including the collapse of the main spire and the entire roof. This was so very sad to read about at the end of my workday. I am hopeful that it can be restored and that the art treasures can be saved. Truly sad. I am not very optimistic. The oldest parts of the gothic architecture and Interior (11th – 12th Century, I think) was made out of wood. As far as I can remember, parts of Notre Dames de Paris were therefore called “The French Forrest”. Les Parisiennes watching the fire were silently crying and in the TV news you could hear that some people started singing from a distance …Probably, the cathedral will be reconstructed but the original building and many artefacts seem to be lost forever. And copies don’t have any soul. ← Insight No. 94: Breakingthrough Technologies – Safer Nuclear Power Reactors Ahead?? ?